Every week day im going to post the picture that sakurai post on his website here with the caption from miiverse. "Pic of the day. Just like in the original game, the Dark Emperor can cause status changes based on a fighter's color. Red types generally get powered up. On a different subject, the Mii Fighter is wearing a Mii Force Helmet." Wait, red types get powered up? Does that mean it's advantageous to be red? I guess it's a minor thing but that seems nuts. Edit: We're allowed to comment on these, right? fizz wrote: Wait, red types get powered up? Does that mean it's advantageous to be red? I guess it's a minor thing but that seems nuts. And about today's, those colors are really cool. "Pic of the day. The character farther in the back isn't from the Imperial forces, and the character in the front is not the infamous drum-playing puppet in Osaka. 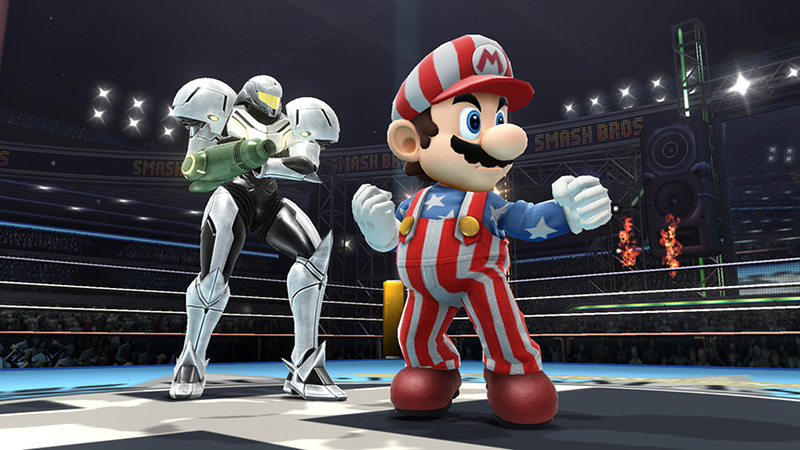 No, Mario is actually wearing an outfit from Family Computer Golf: U.S. Course! NES Open Tournament Golf might be a more familiar title." Man, I like both a lot. That samus suit is pretty similar to the one they're putting into PM! Yeah you're probably right. They also put in that stage from Skyward Sword that PM has. "Pic of the day. 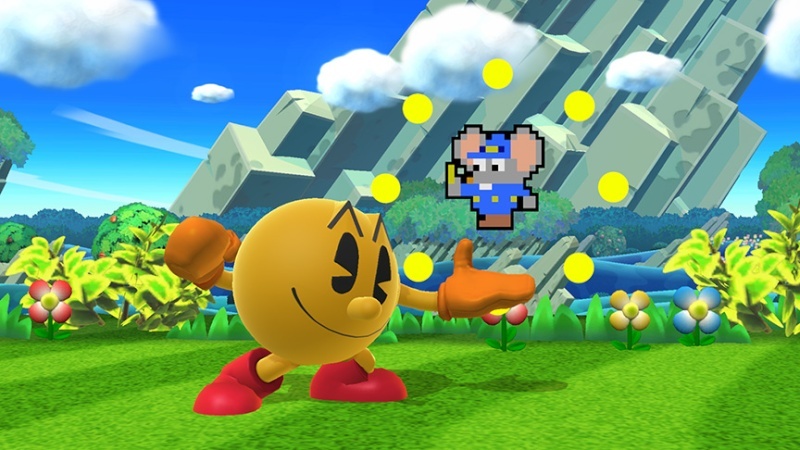 Pac-Man's up taunt is known as Namco Roulette! Namco characters from the 1980s will randomly appear." "Oh, by the way! I'd like to reveal a new challenger. Instead of doing the unveiling on something like a Nintendo Direct, we're going to live-stream the reveal on the official website on Monday, July 14, at 7:00 AM US Pacific Time (4:00 PM European Central Time). Looks like we're nearing the bottom of the stash of new challenger videos that we've made... Like always, we put a lot of effort into it, so I hope you'll enjoy watching it live." All of the popular guesses are Chrom, Shulk, Ridley, and Chorus Men. I'd be fine with any of them (even though I've not played 3 of those games) or anyone really. Mega Man is all I wanted in this game in terms of new people so I'm good. Ridley would blow my mind if he's announced on Monday. Cmon sakurai! I can see it being Shulk or Chrom. But if it is Chorus Men, that's pretty much the final nail in the coffin for the Gematsu nay sayers. I personally would really want it to be someone NOT from the Gematsu leak list. Cmon Sakurai! Yeah, I'd like it to be someone else too because I don't know like any of those characters. :/ I haven't played the Metroid games much either but Ridley seems like he'd be a cool character. It's the weekend. I can wait. This will give me something to look forwards to on Monday. "Pic of the day. 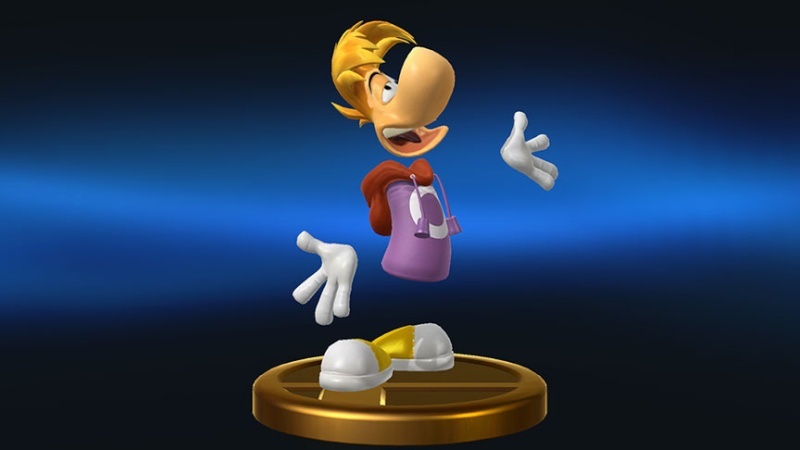 In order to make Rayman's trophy, we asked Ubisoft to share their references. We were expecting to receive 2D drawing references for Rayman, but to our surprise, they sent us data of a brand new 3D model that they rendered for this game!! And that was how this trophy was created. It takes a lot of work creating each model, so it's wonderful that the creators contributed their own efforts!!" It's odd that they would go through the trouble of getting permission to use 3rd party characters and then only put them in as trophies. Why do that? "Pic of the day. Along with Robin, Lucina joins the battle!! Her physical ablilites are identical to Marth's--it must be in her D.N.A. However, where Marth's power is concentrated in the tip of the sword, Lucina's attack strength is balanced throughout the weapon, which might make her easier to control. She's also a little bit shorter than Marth." "With the Wii Fit Trainers, the male and female Robins, the Villagers, and Little Mac, varying their appearances and voices works just like selecting alternate color variations. However, whenever there is even a small difference in abilities, that character gets an actual roster slot. That is why you can select Lucina individually." "By the way…there's probably no chance you'll be able to see this in the game, but Lucina has the mark of Naga in her left eye."